The hosts levelled the series with a 26-run win in the 2nd One Day International played at Bridgetown, Barbados on Friday. Thanks to Hetymer's century, West Indies posted a decent total (289/6) on the board. Sheldon Cottrell and Jason Holder bowled brilliantly to dismiss England for 263. England captain Eoin Morgan won the toss and decided to field first. Chris Gayle and Campbell made a cautious start as the duo scored 49 runs in the 10 overs. The explosive Gayle looked in sensational form with some great hitting. John Campbell was dismissed by Plunkett for 23 runs. Campbell and Gayle put on 61 runs for the opening wicket. Chris Gayle made the batting look easy and reached his fifty off 61 balls. After completing his fifty, Adil Rashid dismissed Gayle for 50. Shai Hope played with positive intent before being caught by Jonny Bairstow for 33. Hetymer and Darren Bravo steadied the innings with a 76-run stand for the fourth wicket. The hard-hitting Hetymer reached his fifty off just 47 balls. Bravo and Holder were dismissed in quick succession. Carlos Braithwaite struggled to time the ball as he scored just 13 runs off 22 balls. Hetymer and Nurse added 52 runs for the seventh wicket. Hetymer reached his century off 82 balls and remained not out on 104. West Indies posted 289 for 6 at the end of 50 overs. In reply, Sheldon Cottrell jolted England with two big blows as he dismissed Jonny Bairstow and Jason Roy cheaply. Joe Root and Eoin Morgan steadied the ship as England reached 42 for 2 at the end of 10 overs. Joe Root looked in good touch but was dismissed for 36 runs. Ben Stokes came to the crease and took his time to settle. Eoin Morgan took on the West Indies bowlers and reached his half-century off 68 balls. Ben Stokes also played some lovely strokes. Eoin Morgan was dismissed for well made 70. Eoin Morgan and Ben Stokes added 99 runs for the 4th wicket. Ben Stokes took the charge for England as he reached his fifty off 60 balls. Ben Stokes was dismissed by Jason Holder for 79 runs. Ben Stokes and Jos Buttler added a quickfire 69 runs for the fifth wicket. Jason Holder struck twice to dismiss Jos Buttler and Tom Curran in quick succession. Moeen Ali and Adil Rashid added 27 runs for the 8th wicket before Sheldon Cottrell dismissed both batsmen in the same over. Carlos Braithwaite picked up the last wicket of Plunkett to help West Indies win the 2nd ODI by 26 runs to level the series 1-1. 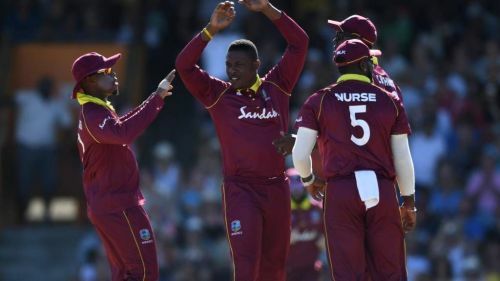 Brief scores: West Indies 289 for 6 in 50 overs (Hetymer 104*, Chris Gayle 50, Shai Hope 33, Mark Wood 1/38) beat England 263 in 47.4 overs (Ben Stokes 79, Eoin Morgan 70, Sheldon Cottrell 5/46, Jason Holder 3/53) by 26 runs.